The world would be such an unhappy place with no women in it to love and cherish as well as to be loved and cherished. Women always inspire men to perform real feats, achieve important goals, and just do nice things. In spring we traditionally celebrate International Women’s Day, and Salvatore Burgo created a perfect menu to mark the occasion: grilled scallops and shrimp, shrimp&strawberry risotto, black ravioli with seafood, and bavarese with berries and white chocolate. 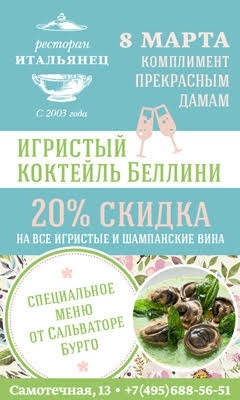 On March, 8 every lady gets an exquisite Bellini cocktail with peach liqueur as a compliment, also there is 20% discount on all the sparkling wines. Here comes the spring!